Certify your data center and enterprise installations in the shortest time The WireXpert with its unparalleled 2500 MHz measurement range is the first cable certifier with capability to certify the highest performance cabling systems in enterprise networks and data centres. Cable installers make significant gain in productivity with WireXpert‘s industry leading test speed and ease of use. With certification testing up to Class FA and CAT8 copper cabling as well as MPO SM and MM fiber optic cabling WireXpert is ready for 40G and beyond. 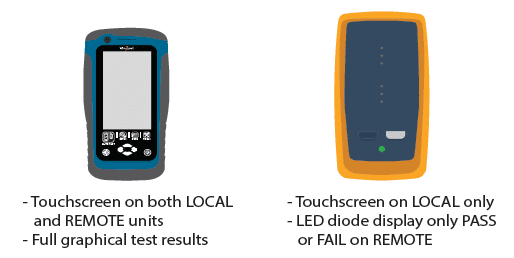 Dual control system allows engineers to control the tester and view or save results from both main unit and remote this makes it possible for one engineer to carry out tests reducing the time spend on site testing. 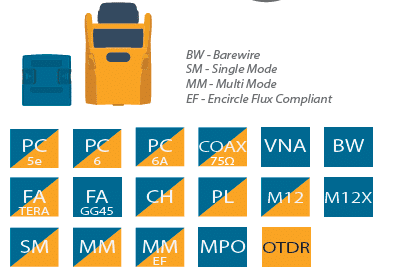 Wide range of fibre optic test modules so the WireXpert is truly versatile tester with Psiber Data continually developing new products for example being the first manufacturer to develop MPO fibre testing for Data Centres using a standard cable tester. 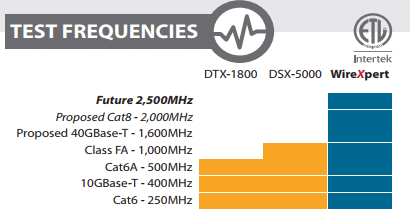 Protects your Investment: Beyond 10G with CAT8 ready cable tester currently the only tester available that do this! Cabling systems are evolving rapidly with CAT8 standard for copper cabling on the horizon and rapidly growing use of MPO and Single Mode cabling for 40G Ethernet and beyond. 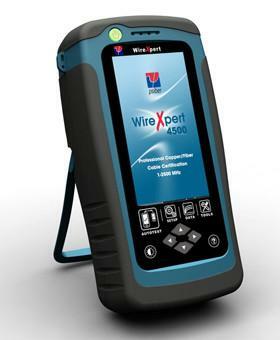 The powerful measurement engine of WireXpert 4500 performs the most complex cable certification tests accurately and in a matter of seconds you will know the answer to “PASS or not?” WireXpert 4500 is your best and probably the only investment in test instrument. 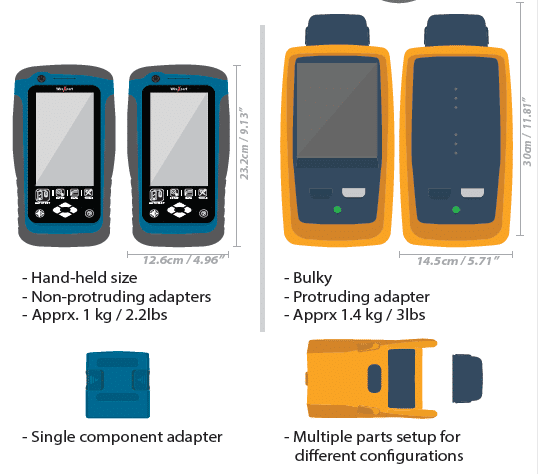 With a large number of application specific detachable test adapters you can test many different types of cables and components. WireXpert 4500 has test adapters for all categories of copper patch-cords multi-mode MPO cables simplex multi-mode and single-mode links industrial Ethernet cabling systems (1G and 10G) coaxial cables and more. WireXpert 4500 even offers a range of specialised adapters for lab testing. In fact some of the most reputed cable vendors use WireXpert 4500 in their research labs to qualify newly developed cabling components. We welcome you to experience the speed of testing accuracy and simplicity of WireXpert 4500! Fiber optic splicing is an important method of joining two fiber optic cables together. It is a preferred solution when an available fiber optic cable is not sufficiently long for the required run. Besides, splicing is designed to restore fiber optic cables when they are accidentally broken. Nowadays, fiber optic splicing is widely deployed in telecommunications, LAN (Local Area Network) and networking projects. Typically, fiber optic splices can be undertaken in two ways: fusion splices and mechanical splices. This paper firstly illustrates the specific process of fusion splicing method and mechanical splicing method, then makes a comparison of the two methods for your reference. Fusion splicing is a permanent connection of two or more optical fibers by welding them together using an electronic arc. It is the most widely used method of splicing as it provides for the lowest loss, less reflectance, strongest and most reliable joint between two fibers. When adopting this method, fusion splicing machines are often used. Generally, there are four basic steps in fusion splicing process as illustrating in following one by one. The splicing process begins with the preparation for both fibers ends to be fused. So you need to strip all protective coating, jackets, tubes, strength members and so on, just leaving the bare fiber showing. It is noted that the cables should be clean. A good fiber cleaver is crucial to a successful fusion splice. The cleaver merely nicks the fiber and then pulls or flexes it to cause a clean break rather than cut the fiber. The cleave end-face should be perfectly flat and perpendicular to the axis of the fiber for a proper splice. When fusing the fiber, there are two important steps: aligning and melting. Fist of all, aligning the ends of the fiber within the fiber optic splicer. Once proper alignment is achieved, utilizing an electrical arc to melt the fibers to permanently welding the two fiber ends together. A typical fusion splice has a tensile strength between 0.5 and 1.5 lbs and it is not easy to break during normal handling. However, it still requires protection from excessive bending and pulling forces. By using heat shrink tubing, silicone gel and/or mechanical crimp protectors will keep the splice protected from outside elements and breakage. If you want the splices to be made quickly and easily, the mechanical splice is a better choice. A mechanical splice is a junction of two or more optical fibers that are aligned and held in place by a self-contained assembly. A typical example of this method is the use of connectors to link fibers. This method is most popular for fast, temporary restoration or for splicing multimode fibers in a premises installation. Like fusion splice, there are also four basic steps in mechanical splice. Fiber preparation here is practically the same as for fusion splicing. Just removing the protective coatings, jackets, tubes, strength members to show the bare fiber. Then ensuring the cleanliness of the fiber. The process is the same as the cleaving for fusion splicing. It is necessary to obtain a cut on the fiber which is exactly at right angles to the axis of the fiber. In this step, heating is not used as in fusion splice. Simply connecting the fiber ends together inside the mechanical splice unit. The index matching gel inside the mechanical splice apparatus will help couple the light from one fiber end to the other. Once fibers are spliced, they will be placed in a splice tray which is then placed in a splice closure. Outside plant closures without use of heat shrink tubing will be carefully sealed to prevent moisture damage to the splices. Both fusion splicing and mechanical splicing method have their advantages and disadvantages. Whether choosing fusion splice or mechanical splice depends on the applications. The fusion one provides a lower level of loss and a higher degree of permanence than mechanical splicing. However, this method requires the use of the expensive fusion splicing equipment. In view of this, fusion splice tends to be used for the long high data rate lines that are installed that are unlikely to be changed once installed. The mechanical splicing is used for applications where splices need to be made very quickly and where the expensive equipment for fusion splices may not be available. Some mechanical fiber optic splice easily allows both connection and disconnection. In this way, a mechanical splice may be used in applications where the splice may be less permanent.